Asparagus Salad Recipes are so amazing! 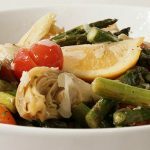 My recipe is made with roasted asparagus, fresh lemons, sweet cherry tomatoes and marinated artichokes hearts are topped off with a light, bright and easy lemon vinaigrette. Drizzle asparagus with olive oil. Sprinkle with salt and pepper. Spread on a baking sheet and roast in the oven for 10 minutes. Remove from pan and place in a large bowl. Slice one lemon in half and squeeze the juice. You'll need 1/4 cup juice. Take the remaining lemons and slice into wedges. Combine with the cooked asparagus. While the asparagus is roasting, clean the tomatoes. If any are oversized, slice in half. Add to the bowl with the asparagus and lemons. Drain the artichoke hearts and place them in the salad bowl. Mix the vinaigrette. Drizzle over about half over salad and toss well to mix the ingredients. Sprinkle the parmesan shavings over the top. Serve and enjoy! Leftovers can be refrigerated. This is a great make-ahead salad. It's perfect for a buffet or bbq because it doesn't contain any mayonnaise.